I am a Swedish reporter and author, working for newspapers, magazines, radio, and television. While specializing in in-depth journalism about social affairs, culture, politics, and the media, I also write columns, features, and travel stories. I have written more than twenty nonfiction books, several of them dealing with American themes. Two of these are based on material that I have gathered during long stays on Indian reservations, while ”Cowboy” is a collection of stories from those backroads and backwaters in America where the news media rarely goes. 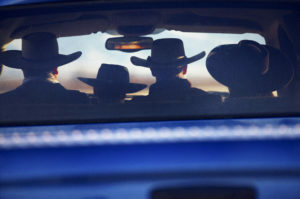 These books have received extraordinary reviews in Sweden, and ”Cowboy”, now in its second edition, has been embraced for its clever use of language and its insights into lesser known parts of the US. My other books in Swedish deal with topics such as honor culture and the strange politics attached to it, battered women in hiding, and Somalis living in Sweden. The two books I have published in English have been very successful with American critics. “West”, with Lars Strandberg (photo) and Ronnie Nilsson (design), is a big format production dealing with the American West, and it is released by US publisher Gibbs Smith. In 2012, “West” won the prestigious Swedish Design Award, in the books category. According to U.S. critics it is “unique”, “gorgeous”, “stunning”, “marvelous”, “uniquely perceptive and querying”, and “truly magnificent”; “an extraordinary coffee table book” and “a definite ‘must have’ book”. “Floating in Sausalito” is my book about the colorful California houseboat culture, produced with Lars Strandberg (photo). When the Los Angeles Times and the San Francisco Chronicle picked their favorite Christmas gift books in December 2016, “Floating in Sausalito” was on both lists! All in all, the U.S. reviews have been very favorable: “Handsome and invaluable”, “Sensitive and compassionate”, “Improbably but brilliantly written and photographed by two Swedes named Lars”. In its review, German newspaper Welt am Sonntag calls it “A joy!”. My 2017 book on integration and segregation in Sweden, “Framtidsstaden” (“City of The Future”), has gotten a lot of media attention and it shot to the top of the national internet bookstore bestseller lists as soon as it was published! In May 2018, my follow-up, “Landet där vad som helst kan hända” (“The Country Where Anything Might Happen”), was published and met with critical acclaim. It is a personal account of the effects of migration and the values and policies behind the changes taking place in Sweden.